A Unibead liner simply means you have the choice to install the liner in one of two ways, as a beaded liner, or as a J-hook liner (a.k.a. V-bead liner). 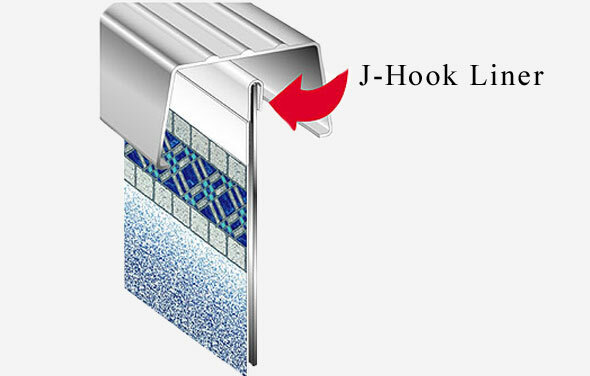 J-hook liners have a special attachment that is intelligently referred to as the “J-hook” (similar to built-in coping strips). 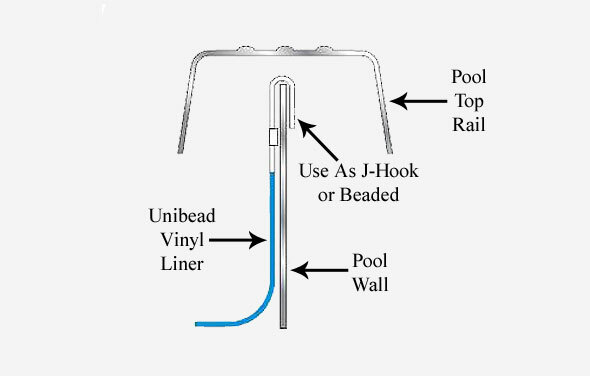 The J-hook is pre-attached by the liner manufacturer to the top of the liner and hangs directly on the top of the pool wall when installed. 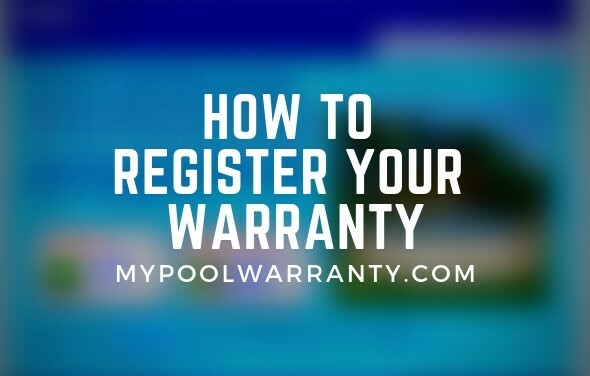 Since it is custom fit for the height of the pool, with the proper amount of sand on the ground surface, there will be no need to adjust the liner height during installation. Beneath the J-hook portion, there is also a beaded section on the liner as well. Separating the two is a slightly perforated edge that allows for easy removal of the J-hook. 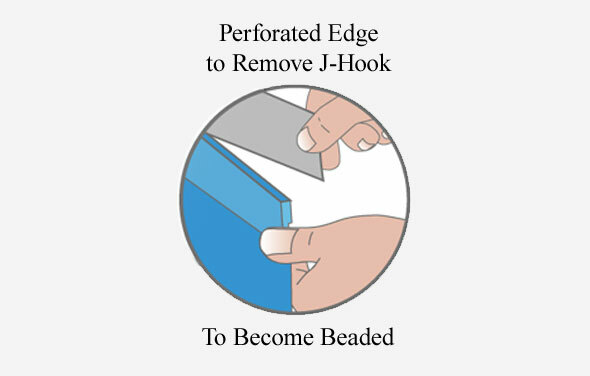 Simply cut through the J-hook to the perforated edge and then peel the entire circumference of the liner until the entire J-hook section is removed. Once completing this, only a beaded liner remains! The now beaded liner is ready for installation and can be inserted into the bead receiver. 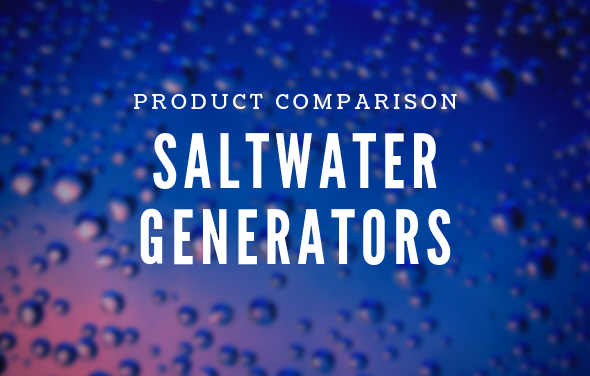 Just like using the J-hook liner, there is no need to adjust the height of the liner as long as the proper amount of sand is prepared on the ground before installing the liner. 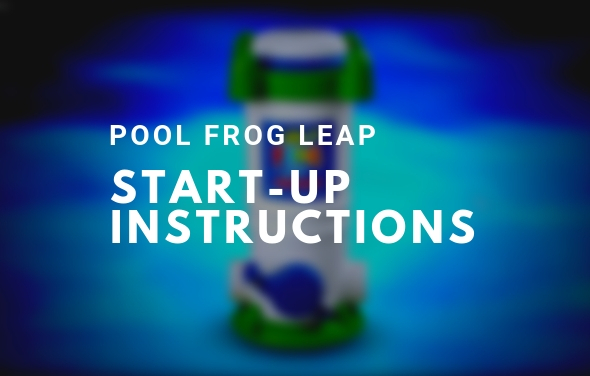 Most above ground pools do not come with the bead receiver sections needed to install a unibead liner as a beaded liner. Be sure to purchase the bead receiver separately if you are certain you would like to install the liner this way. 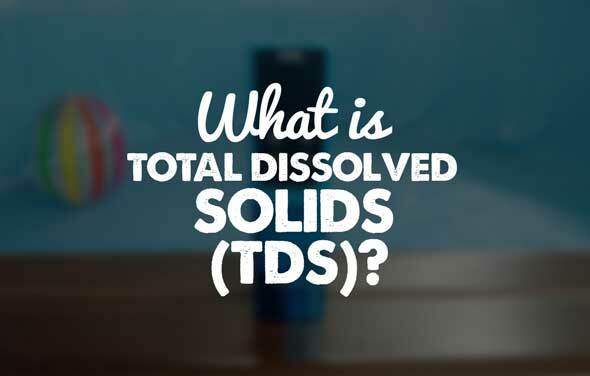 The following table displays a pools size and shape and the recommends amount of bead receiver's one would need based off those dimensions. 10' Pool Round 8 pcs. 12' Pool Round 10 pcs. 15' Pool Round 12 pcs. 18' Pool Round 15 pcs. 21' Pool Round 17 pcs. 24' Pool Round 19 pcs. 27' Pool Round 22 pcs. 30' Pool Round 24 pcs. 33' Pool Round 26 pcs. 7'x13' Pool Oval 9 pcs. 7'x15' Pool Oval 10 pcs. 8'x12' Pool Oval 9 pcs. 8'x14' Pool Oval 10 pcs. 8'x15' Pool Oval 11 pcs. 8'x16' Pool Oval 11 pcs. 8'x19' Pool Oval 12 pcs. 10'x15' Pool Oval 11 pcs. 10'x16' Pool Oval 11 pcs. 10'x18' Pool Oval 13 pcs. 10'x19' Pool Oval 13 pcs. 10'x21' Pool Oval 14 pcs. 12'x16' Pool Oval 12 pcs. 12'x17' Pool Oval 13 pcs. 12'x18' Pool Oval 13 pcs. 12'x20' Pool Oval 14 pcs. 12'x21' Pool Oval 14 pcs. 12'x24' Pool Oval 16 pcs. 12'x27' Pool Oval 17 pcs. 14'x20' Pool Oval 14 pcs. 15'x23' Pool Oval 16 pcs. 15'x24' Pool Oval 17 pcs. 15'x26' Pool Oval 18 pcs. 15'x30' Pool Oval 20 pcs. 16'x26' Pool Oval 18 pcs. 16'x32' Pool Oval 21 pcs. 18'x33' Pool Oval 22 pcs. 18'x40' Pool Oval 25 pcs. The exact measurement of your pool wall is extremely important when installing a unibead liner. Be sure to triple check the height so that the proper liner is ordered. 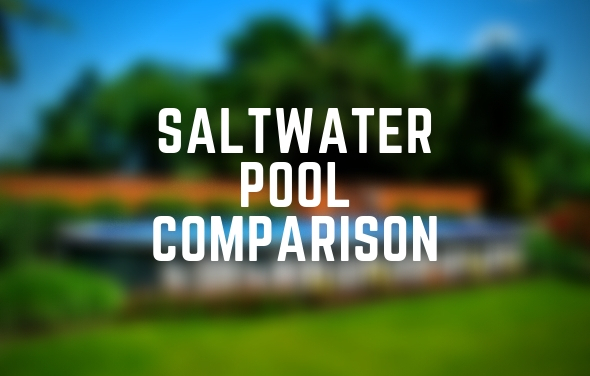 All above ground pools call for 3”- 4” of sand to be leveled after the wall has been erected and an additional cove or angle of sand against the pool wall before the liner is inserted. Foam cove can also be installed on top of the 3”-4” sand base. This will give you a total height of approximately 7” of sand (or sand/foam cove combination) at the base of the pool wall. Since it is not possible to adjust the height of a unibead liner, it is very important to have the proper amount of base material to prevent over-stretching of the liner or damage to the pool wall. 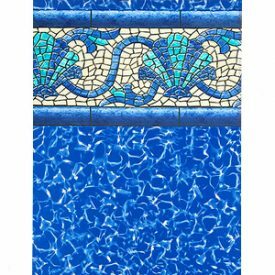 Unibead Liners can be used with above ground pools to replace an overlap liner, a J-hook liner, or simply remove the J-hook section and use with bead receiver as a traditional snap-in beaded liner. Can I replace unibeaded liner with overlap? Yes, you can replace a unibead liner with overlap liner. You would just need to purchase plastic liner coping strips to install the overlap liner. 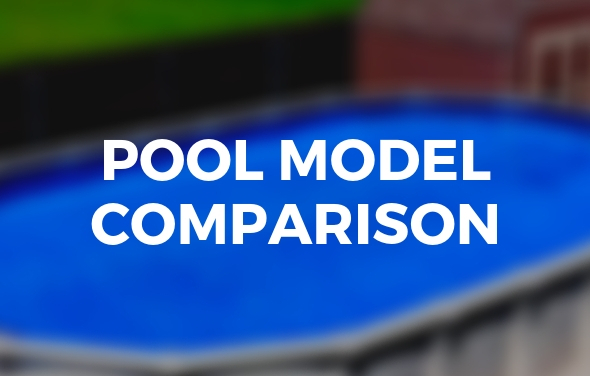 can you use a j hook liner on any above ground pool?